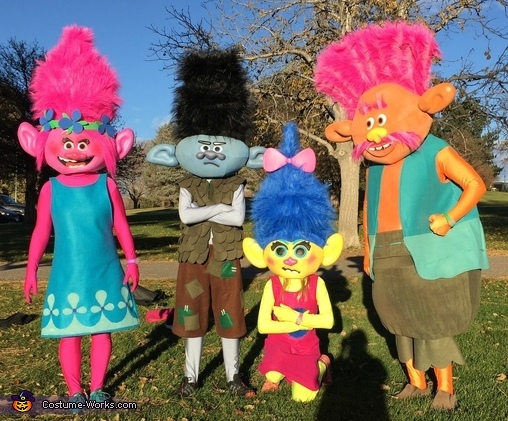 My 10 year old daughter won out this year with her idea for Halloween – characters from the Trolls movie. She was dying to be Smidge from the movie – OMG! So my wife took Princess Poppy and I (the dad) took King Peppy. My 12 year old son wasn’t too hot on the costume idea this year, so he was type cast as the grumpy version of Branch. He soon realized how popular Branch was and warmed up to the idea. As an engineer, I of course had to start by modeling the heads and figuring out how to make a really tall wig that wouldn’t fall off our heads. I take surfaces from the solid model and run them through Pepakura software to create all the flat pieces. I then prototype the head using card stock. The final heads are made from sections of 5mm craft foam glued together using contact cement on the edges. The frame to hold the hair wigs was also made from 5mm foam. For the ears and noses, I used my homemade vacuum table to form the foam sheets over simple molds. I heat the 5mm thick EVA craft foam in the oven at 275F in a metal frame, position it over the mold, and then turn on the vacuum to shape it. I make the molds from pink insulation foam sheets. The hair is made from colorful legwarmers from the party store (perhaps the most expensive part of the costume, as we had to purchase 8 pairs for all the hair). My wife and mother-in-law did the all the sewing for the felt outfits. Colorful body suits finished off the costumes. We even made our Hug Time watches from color changing LED bicycle spoke lights. The flower petals were formed from acrylic sheet heated in the oven and formed in a metal cup. I didn’t have time connecting them to a watch to go off on the hour, so it was Hug Time all the time. The costumes were quite the hit, given the popularity of the movie. We typically attend several local zoo Halloween events, and had long line up of folks waiting to get their picture with us. It was all good until too many little kids tried to hug Branch. My son didn’t like that too much - just like Branch. All-in-all another great Halloween. Hope you like the costumes! Wow, I love this!! Great job!